Making fresh pasta from scratch is something I’ve only recently acquired. Or to be really honest, it’s something that my husband Marco has acquired. Whenever there is bread making or pasta making involved, he’s my man. There’s just something about him and dough. Maybe it’s those big, slightly rough hands – they may not be delicate enough for, say, cake decorating, but he’s much more a fresh pasta and bread lover than he is a sweet tooth anyway. As you may have read, when we met nearly seven years ago, he had never even been behind a stove before. Now he spends a significant chunk of his free time in the kitchen, watching over our seedlings or researching video recipes for a new dish to try out. It combines well with his job as a sommelier in some of Melbourne’s top restaurants, but this passion for and knowledge of food and wine wasn’t passed down to him. It simply grew, and around our house a passion for food gets nurtured. It’s something that made me think about how we normally acquire cooking skills or a passion for cooking, as Marco seems to have done everything the other way around – not through the family, but by discovering it later and using the internet to learn more. 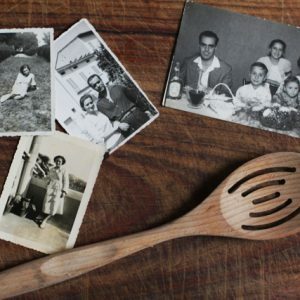 This food for thought is partly what inspired me to write this article, What your Grandparents Knew, for The Locavore Edition, pondering whether our modern, urban lifestyle is killing off the food skills our grandparents once knew about, or is it actually reviving it? 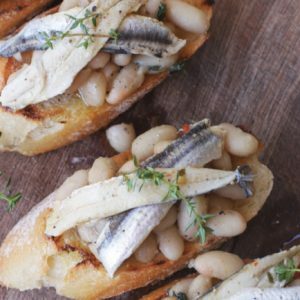 I have always had a love for food and cooking from scratch, but growing up and spending most of my life in big cities, I never knew about foraging for food or even seasonal produce until I moved to Italy where, even in a city like Florence, the seasons pervade everything from the supermarket to the local trattoria or bakery. There is a time and place for every kind of produce. I soon learned that in Florence you only eat real mushrooms – not button ones, but freshly foraged ovoli (Caesar mushrooms) or porcini for one month of the year, if it’s a good season. The truffle season is even shorter. Tomatoes, fresh, ripe, and I mean properly ripe, are gorged on in the summer but only the tinned kind or passata used the rest of the year. Meanwhile, the long winter months are for endless cavolo nero, used in everything – don’t get me wrong, I love it, but after months of cold weather, I can barely look at it anymore. The markets tell you what month it is by just a glance at the sprawl of produce. And while at times I used to lament about the lack of variety, I rejoiced the fact that it was undeniably freshly harvested. 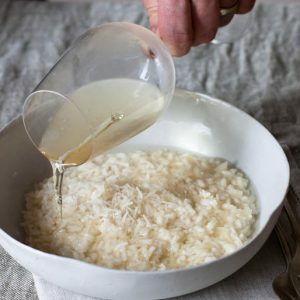 In the seven years that I lived in Florence, I acquired skills and knowledge about food that changed everything about the way that I thought about food, traditions, culture, cooking and eating habits. We now carry this love, appreciation and curiosity for real homegrown, homemade food with us wherever we go. And luckily in Melbourne there is no shortage of likeminded people with great resources. The amount of local markets, urban gardeners and urban beekeepers here constantly surprises and amazes me. The internet is probably our first go-to source for knowing where to go and how to connect with local food in our area. An example? I came across this nettle thanks to twitter. One afternoon spent tweeting with some local chefs and food writers about foraging in Melbourne and I was offered two lots of nettle, in fact. Merricote restaurant chef, Rob Kabboord, gave me a newspaper-bound bouquet of stinging nettles after seeing my tweet asking for nettle locations around the city. And another, who goes by @Brock_Jay, who had nettle taking over his garden, suggested swapping a basket of nettles for a recipe. I tweeted him this recipe for nettle tortellini in brodo and, as promised, he dropped a basket full of stinging nettles around to the studio. How good is that? When would this have been able to happen to our grandparents? With our bountiful nettle, I wanted to make something that could be stored easily so as not to waste it. We decided to make a green pasta, much like they do in Bologna for a traditional lasagne or tagliatelle verdi, only with nettles instead of the usual spinach. Once you have rolled it out in the desired shape, it freezes well so you have it on hand, ready to go when needed. The nettles are first blanched to take away the sting so you can handle them, then squeezed of every last drop of water before being blended with the eggs to make a paste of sorts. This egg mixture is blended with the flour, just as you normally would with just eggs: create a pyramid of flour on a clean surface and then make a “well” in the middle. Pour in the egg mixture and with a fork or with your fingers, begin to incorporate the flour little by little into the egg mixture. The beauty of this age-old technique is that, depending on the size of your eggs and the moisture in the nettle, you may not need all of the flour – so you can stop mixing once you achieve a dough that is no longer sticky. Knead for about 5-10 minutes or until you have a wonderful, elastic ball. It should bounce back if you push a finger into it. As with all doughs, you should let it rest for at least 30 minutes before using it. 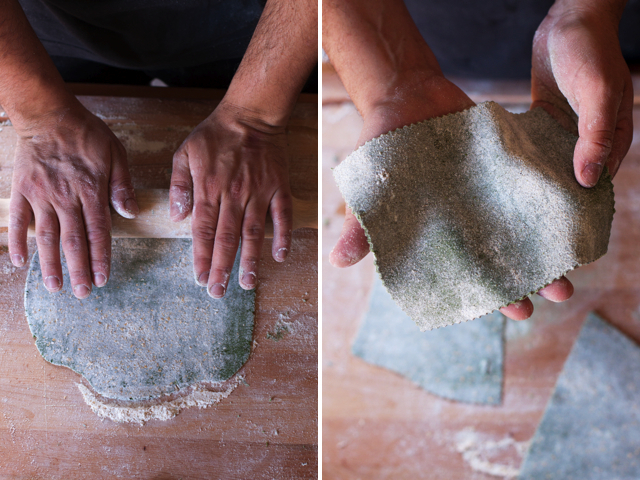 You can roll it through a pasta rolling machine if you want to make tagliatelle verdi, green tagliatelle, which is wonderful with ragu as the Bolognese eat it, or as Artusi suggests, simply with butter and Parmesan cheese. Here, we’ve just rolled it out with a rolling pin, keeping it just slightly thicker, to make green lasagne sheets, ready for layering with Zia Nerina’s ragu, bechamel and Parmesan cheese. I love foraging for food… My Swiss grandparents also ate a lot of nettles. They made soup with them. This recipe is wonderful and I bet those pasta taste great! Nettle soup, wonderful and so nutritious! My mum also eats a lot of nettle soup in Switzerland with a hunk of cheese and some bread. Even when she lived in England she used to make nettle tea by dunking a big (probably 5″ long) cutting into her mug and pouring boiling water over it! 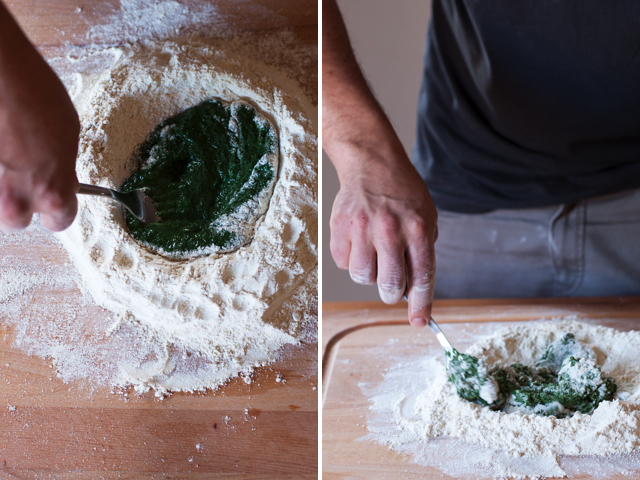 This pasta looks like a lovely way to use nettles – I really need to get back into making pasta. That sounds fabulous. Nettle tea is so very good for you, it’s especially good when it’s in season (spring) and hay fever attacks! It’s a natural antihistamine – isn’t nature amazing?! A great pasta recipe! I read through again your Orecchiette con Broccoli: The way to a man’s heart post and it’s still so romantic! What a lovely story – while the internet can be such a burden sometimes it also opens amazing new avenues and I love how people who love food want to share that passion, whether online or in person. This pasta looks absolutely beautiful – I love the deep green colour. One day I will forage my own nettles and make it – in the meantime, could I substitute spinach or similar? You could absolutely use spinach or silverbeet too (the ‘normal’ recipe for pasta verde is with spinach) – just do as you would for the nettle here, blanch it and drain it very, very well. Brava…. a wonderful article and use for my frozen nettles since here in N.Y. it is snowing and you have reminded me of the warm day I went collecting. There’s another treasure in this article, Emiko. That is your tag to your grandparents article which in itself was quite encouraging and well written. I am a homesteading nonna who has always loved the old ways, many of which were not passed down but found in people with like interests. The little I navigate this computer has showed me the incredible resurgence of old ways, many wonderful people and how life changing experiences can be brought about. BUT I believe it is all about the people. Your grandparents article had a tag to Urban Garden Share. Though they are not in N.Y., I will see if they can direct me to someone that would like to rent/barter and grow on my small pasture that once fed my goats. Without the internet I would not have this lead BUT without you, I would not be here reading your blog and always looking forward to the next one. Thank you Diane, I so enjoyed reading your comment! This is yet again another reason why I find the food community on the internet so compelling! Frozen nettles (or frozen spinach) is really well-suited to this recipe. Good luck with the Urban Garden Share! It’s pretty incredible to me thinking back to my childhood growing up in very small-town Kansas how my mother instilled in me many of the principles that my food “idols/mentors” see as essential now without me ever realizing it until recently. Eating the tomatoes straight from the garden that always tasted better than any from the stores, picking mulberries, apples, walnuts from “wild” trees near our home, canning and freezing summer’s bounty for the colder months, cooking the “nasty bits” when we had a fresh rabbit or venison, creating a dinner from pantry/leftover foods when it seemed we had nothing to eat. I am thankful to have been given such an education that I now try hard to expand upon (and am very thankful for the internet and people like you that lend a hand in that search for knowledge). I hope that in the classroom of my kitchen that one day my pasta will finally turn out as beautiful as your husband’s. Hi Sarah, this is beautiful! You are indeed very lucky to have been brought up with all that wonderful food experience. Thanks for sharing! I am amazed at how the internet connects us and love twitter for those unexpected moments. I was raised during the time of convenience foods (tv dinners and the like) but today I am inspired to learn the old ways of preparing food from scratch. 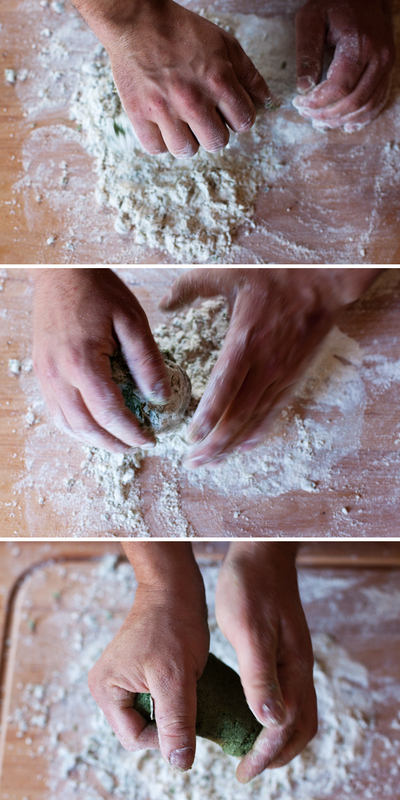 Making pasta by hand has long been on my list, and now I’m going to have to give it a go! It’s amazing once you learn how to do something as simple as making pasta or bread or the like – those things that we take for granted because it’s all so very easy to buy it ready made. But there’s something so satisfying about doing it yourself, and I think that’s what it is that makes my husband love it so much, it is literally a pleasure to make! I’v never foraged nettles. I have just a shy acquaintance with nettles, due to my goofy attempt not to fall in a tiny path in San Gimignano, when I grabbed the first steady plant I found at hand… it was nettle. I still remember my granpa trying to soothe the itching hand with cold water!! Oh no! You wouldn’t forget that experience quickly! I have to say, handling nettles is the least fun part, but you’re rewarded for being careful! What a lovely thing, like me getting the sloes because of Twitter. It’s amazing how many great people you meet trough social media. I love how Marco loves food, you can see the two of you in the kitchen smiling to eachother with anticipation to taste what you are cooking up! To be able to share food and enjoy it to the full is so precious in my opinion. 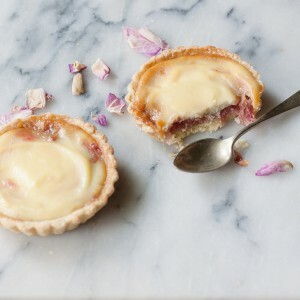 First of all I am happy I have discovered your blog, thanks to Gourmet live. You have a lovely blog and interesting recipes. I have always been curious about nettles. I want to try to do soon or later something with them. So thank you for sharing and inspiring. Thanks and welcome! I hope you find something that you like and let me know how it goes! A link to the carrot gnocchi recipe popped up at the bottom of this post, something I have been meaning to make since you first posted it so thanks for the reminder. Really interesting post and beautiful photos as always my girl! Thanks my dear I know, I think I tend to mention too often that he didn’t know how to cook when I met him because it’s something that amazes me so much (he complains though, “why do you keep saying that?!”)! The carrot gnocchi recipe is one of my favourites! Buon baby girl shower anche da me, oggi. Non ho pubblicato niente: gli auguri te/ve li faccio da qui… e da Firenze! hi, i’m italian and i have the same big love for cooking. your blog is wonderful, i really love your pictures and i feel honored watching your recipes because they show how much you like italian cousin. it’s a pleasure see that people still wants to produce nice food from raw and seasonal products, i found it very health and cheeper:)compliments again for your blog. I am interested to try this recipe. 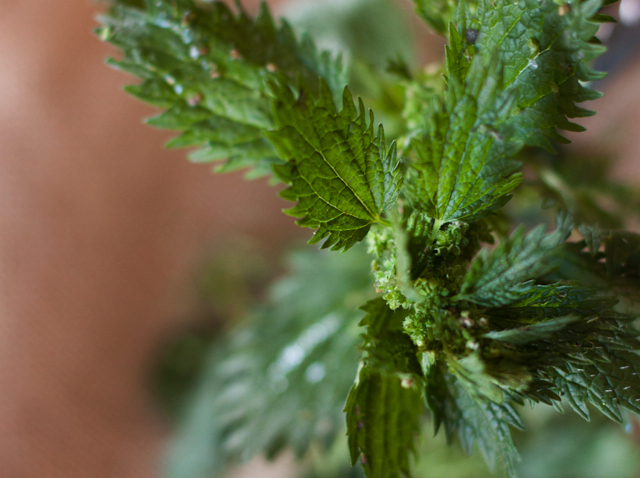 Do you shop the nettles before you blanche them or purree them after? Because the nettles really do sting when fresh (even with gloves on, they can often poke through! ), I always throw them into the pot whole, stems and everything, then I deal with them after they are blanched, when they are totally safe to touch! Hope that helps. I love soup from young nettle cooked in spring. It remains me family home. i have some nettles that i bought fresh, but hung to dry for tea. do you think that dried nettles could be used in this dish, or would the results be poor? I don’t think it would be the same, sadly. Here the fresh nettles give mostly their colour to the pasta, I’m wondering if rehydrating them you could still extract that same kind of colour? You could also use spinach or any other fresh green (borage for example, or silverbeet, even radish tops) that is good for cooking for this pasta.